'Smart glass' can switch from transparent to opaque at the flick of a switch and is increasingly used in cars, aircraft and homes to reduce the Sun's glare and filter out infrared light and heat. Masaki Nakano and colleagues from the RIKEN Center for Emergent Matter Science have now used vanadium dioxide to make a transparent material that can be activated to block infrared light without affecting its transparency for visible light. Vanadium dioxide is a well-known thermochromic material that is transparent below about 30 °C and reflects infrared light above 60 °C. This transition is related to a change in crystal structure that also results in a shift from electrically insulating properties at lower temperatures to conductive properties at higher temperatures. For the first time, Nakano and colleagues have been able to trigger this change using a static voltage rather than heat. Previous attempts were unable to create a large enough electric field to completely switch the material from an insulator to a conductor. 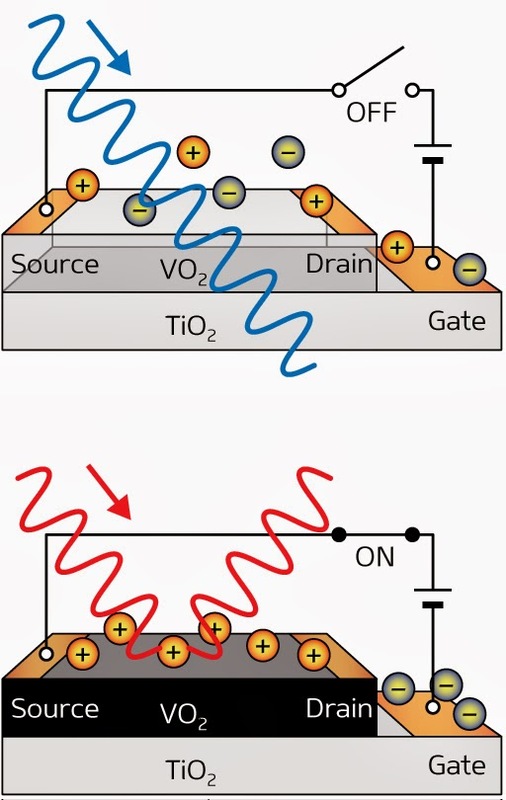 The researchers developed a type of field-effect transistor in which a voltage at a 'gate' terminal controls the conductivity of a vanadium dioxide channel running between 'source' and 'drain' terminals (Fig. 1). In their electric double-layer device, the gate terminal lies not on top of the channel but next to it, which ensures that it does not get in the way of light passing through the vanadium dioxide. The channel and terminals are covered by an ionic liquid, which contains positive and negative molecules. 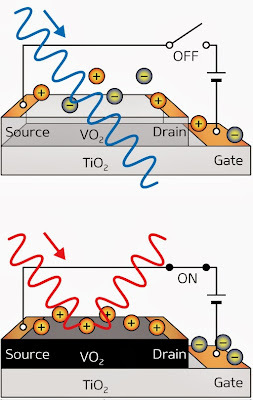 When a voltage is applied, positive molecules accumulate in a nanometer-thick layer on top of the channel, creating a very high electric field. This triggers a metal–insulator phase transition throughout the 50 nanometer-thick layer of vanadium dioxide, causing it to become a conductor and block infrared light. Changing the gate voltage from 1 volt to 3 volts caused the same change in conductivity in vanadium dioxide film as an increase in temperature from 30 °C to 77 °C. While this roughly halved the transmittance of infrared light, visible light was not affected. The device draws almost no dissipative current, which keeps its power consumption very low. "We think that this would be very promising for a future low-energy consumption society," says Nakano. The researchers are now trying to improve the contrast in infrared transmittance between the device's 'ON' and 'OFF' states. "For practical applications," adds Nakano, "demonstrating similar performance in a large-area device is essential."